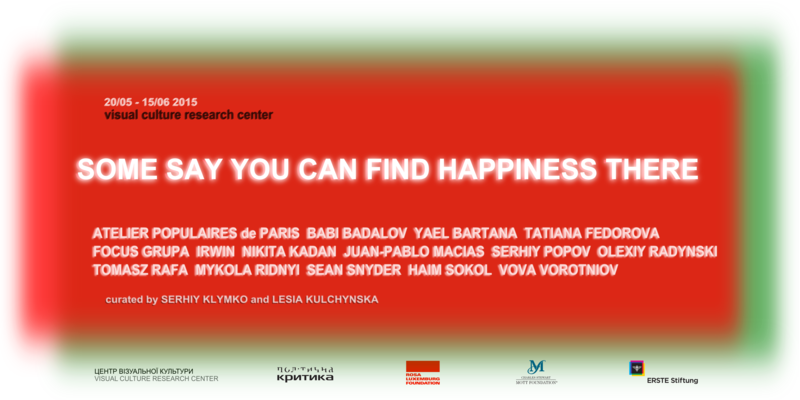 Visual Culture Research Center and Political Critique invite you to the exhibition “Some Say You Can Find Happiness There” at Visual Culture Research Center (Kyiv, Ukraine), which will take place from 20 May till 15 June 2015. Opening: Wednesday, 20 May, at 19:00. Political map of the world may be understood as a museum of collective fantasies, which once gained a piece of territory for their realization. Some of them died, failing the reality-test, but continue haunting their demesnes like specters, some gave up their spaces to other dreams, some carry out expansion claiming new territories. However, there is also a map of imaginary world for the dreams of communities that have vanished or, on the contrary, are still emerging and keep struggling for their place in reality. During the recent year our ideas about the state that used to seem obvious, have transformed into open questions. Maidan, which was compared to a utopian republic, questioned relations between the society and the state, and generated the surge of projects for its transformation. The change in the familiar contours happened before our very eyes, the common visual image of the Ukrainian state is now in conflict with its actual borders, and hundreds of thousands of people woke up in a different country. We witnessed how political utopias, multiplied by a potential of contemporary media, are being implemented, increasing the number of views in social networks, as well as the number of destroyed human lives. Open questions demand answers. We have to look at the map of contemporary political imagination in order to see the ways we follow in search of the common happiness, in order to reconsider concepts and images, which today’s political relations, as well as our dreams and fantasies, are based on. Participants: Atelier Populaires de Paris (France), Babi Badalov (Azerbaijan-France), Yael Bartana (Israel), Tatiana Fedorova (Moldova), Focus Grupa (Croatia), IRWIN Group (Slovenia), Nikita Kadan (Ukraine), Juan-Pablo Macías (Mexico), Serhiy Popov (Ukraine), Oleksiy Radynski (Ukraine), Tomáš Rafa (Slovakia), Mykola Ridnyi (Ukraine), Sean Snyder (USA), Haim Sokol (Russia), Vova Vorotniov (Ukraine). The exhibition will take place within the frameworks of the project “Exploitation of the Imaginary”, dedicated to the research of political imagination in the age of its mechanical reproduction and the capability of art to fight for its right to structure society. Visual Culture Research Center (VCRC) was founded in 2008 as a platform for collaboration between academic, artistic, and activist communities. VCRC is an independent initiative, which is engaged in publishing and artistic activities, scientific research, organization of public lectures, discussions, and conferences. In 2015 Visual Culture Research Center received the European Cultural Foundation’s Princess Margriet Award.